The NST used to have big metal pillars that were a pita to get through. Thinking more about the issue,.it seems that trails should have something flexible that can be easily replaced for the middle of the trail to stop cars (or get them to think before going) but that are also not dangerous when struck by cyclists. Something like the Penn Ave bike lane needs physical separators. A barrier if you will. New Complaint about Beechwood blvd bike lanes needing repainted. It’s one of pittsburgh’s original bikeways, but needs some love. See Photos. This reply was modified 8 months, 1 week ago by Benzo. Bless you! I feel like I’m the grumpy old “get off my lawn” man when it comes to 311ing these. Every little bit helps. You did a fantastic job. My quest to get someone, anyone to trim the north shore trail between the Millvale boat house and the 31st st bridge has failed. Pgh311 says it isn’t pittsburgh (most of it is according to Google maps) and Millvale doesn’t respond. Anyone else have any pull? ah, dammit. I posted this in the wrong forum! a) super sorry, b) don’t reply anymore to this and carry on tag-o-rama. Thanks @jonawebb. My old eyes and brain had a collective fart. 311-d 2 vehicles parked in bike lanes today, one at convention center hotel on Penn Ave and one at Nova Place, North Commons & Federal. I’ve taken to including photos of license plates. At Penn & 10th, 3 bollards bent to ground, 1 quite bent (photo). On Penn near 11th, 2 bollards bent to ground. On Penn near 12th, 2 bollards bent to ground. Please straighten or replace the bollards. 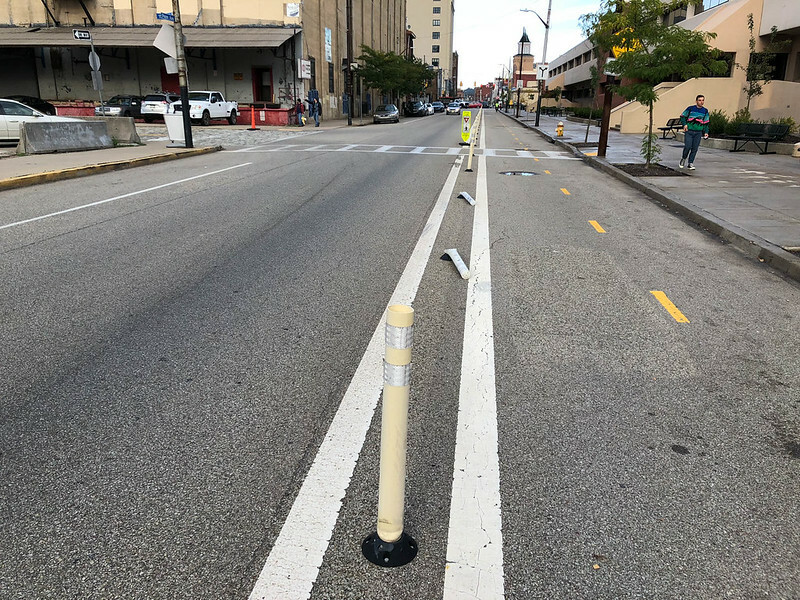 Bollards help protect cyclists in the bike lane. 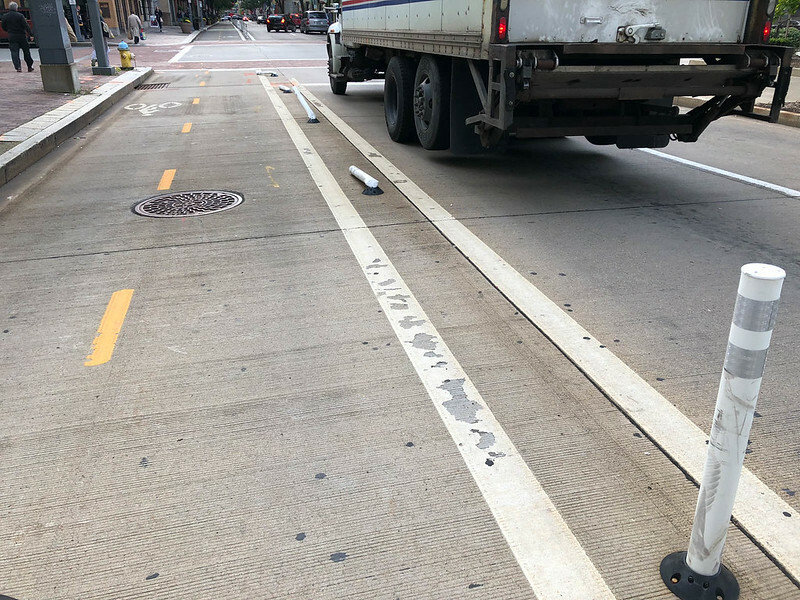 The more of them that remain bent and damaged, the less safe people will feel when using the Penn Ave bike lane, and the more difficult it will be to encourage people to take up cycling in this area. This is particularly important toward helping women, seniors, and parents with children to feel safe. 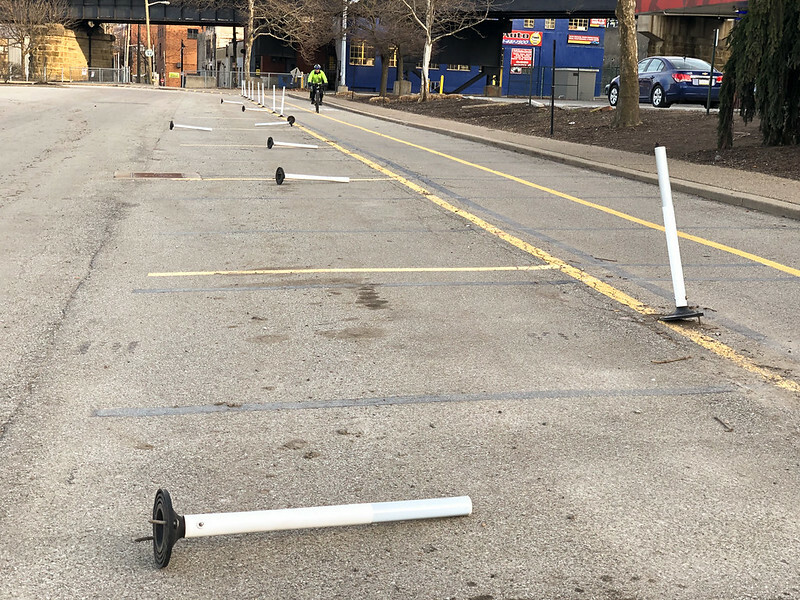 I had been delaying posting 6 of 11 bollards down on north shore trail between casino and penitentiary just because they keep getting run over by Alcosan and other maintenance people and not a lot of people with the lack of brain cells to drive on what is clearly a trail. But at 7 this morning I had 3 cars in a row driving on the trail from around Casino to the Cardello lot. Does anyone know who to contact about changing the type of bollard to one with a spring that will withstand being driven over? Or maybe a coalition of the willing can get some huge boulders and dump them on the trail in such a way that vehicles can’t get through… Though no idea how we’d be able to do that. and, it probably isn’t legal. and stops appropriate vehicle users (DPW, emergency responders) from getting to the trail…. @jstalnaker2112: You could contact Valerie Beichner at Friends of the Riverfront. That organization maintains the trail (I’m a volunteer with them). FOTR does light work such as picking up litter and minor pruning, while the city’s Department of Public Works does heavy work such as replacing bollards, patching asphalt, or mechanized pruning. 311ed the dead canoe on the NST outside of PNC park. It’s right next to the pgh police boathouse. Getting really sick of the increasing number of folks parking in front of the switchback on the North Shore. Glass in westbound bike lane on Forbes Ave in Frick Park (just west of the west end of the bridge). Please street-sweep the glass. Thanks. Today, while biking the bike lane, I rode at the left edge of the bike lane there to avoid the glass, but that puts me in greater danger of being struck by an inattentive driver. Bike lanes clogged with debris like this put cyclists at greater risk. Someone dumped a huge 1980s projection TV (one of those that are basically 6 feet by 6 feet and weigh a million pounds) on the north shore trail (about 1 foot off of the pavement, in the bushes) right next to the pedestrian ramp/bridge to washington’s landing. I 311ed it, and 2 days later it was gone. I guess someone didn’t want to pay a zillion dollars for disposal costs for that. Basically the only place that will take an old TV for recycling is Evolution E-cycling in the southside and a big TV like that will cost $60 to help defray the expenses of getting rid of all of that lead. My guess is that Evolution e-cycling will lose money for every TV like that that shows up. 9 bollards down on Chateau Trail, on 2/3. those 9 have been down at least since last september or october, when they replaced them the last time. Or maybe it was august. I don’t think there was more than 5 days where all the bollards were up. I complained to 311 a long time ago about the bollards on the trail and I got a “we’ll replace them the next time we go out bollarding” type of response. THey must only replace the bollards once a year. It doesn’t stop the ALCOSAN truck (as well as people looking for shortcuts to get to their boats) from crushing them within days of replacement. I sent a message to 311 the day before you, I counted 3 missing and only 3 of 13 still standing. Yesterday I went through and removed the bolts from the 3 spots that are missing, hopefully to reduce a tripping and/or puncture hazard. Thanks. I cycled that last week and forgot to 311 it. The North Shore trail from 16th St to Millvale got a tar-and-chip treatment in (I think) 2013. There are many cars parked on sidewalks throughout the Stanton Heights neighborhood. Many of the cars are completely obstructing the sidewalks. Please issue warnings to residents. Yesterday I reported the following and today I got an email “Your service request ID#: 326102 has been registered and forwarded to the appropriate representative for action”. There were ten bollards down (base ripped out of asphalt) on the Southside Trail just west of the intersection of S 1st St & McKean St on 3/17. (Earlier I reported three bollards down here on 3/14: https://twitter.com/paulheckbert/status/1106422861609095174 . Perhaps St. Patrick’s drunks saw the 3 down and got “inspired”). See picture. Please repair. When I rode through this area on Wednesday afternoon, all of these bollards were fixed.